Weaver’s Craft magazines are a gold mine of information and drafts. Jean Scorgie, a former editor of Handwoven magazine, publishes these little gems and we carry nearly 20 different issues. Each issue features a topic (laces, overshoot, baby blankets, etc.) with information, illustrations, ideas and projects. I recommend these all the time to newer weavers because she really explains the concepts and then provides easy drafts to put the techniques into practice. I am steadily building my collection of these as part of my weaving reference library. Two of my favorite issues illustrate just how much is packed into a small space. April/May 2000 focuses on twills and includes a discussion of twills, plus sections on floating selvedges, smiling selvedges and how to fix them, gamps, and threading heddles. And it has drafts for 5 different dish towels! 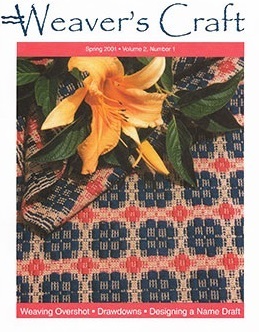 The Spring 2001 edition is all about weaving overshot and has articles about drawdowns, tromp as writ, designing name drafts and more, plus drafts for placemats, table runners and a drawstring bag. And all of these can be woven on a 4-shaft loom! 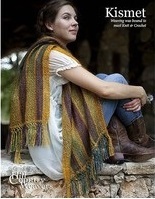 Another overlooked booklet on the magazine rack is Kismet, published by Hill Country Weavers. This is gorgeous, glossy eye candy for weavers loaded with inspiration for thinking (and weaving) outside the box. 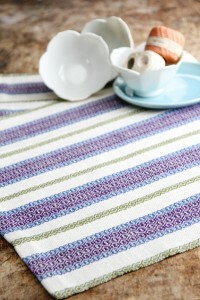 The projects are woven on rigid heddle looms with knitting yarns and incorporate knit and crochet details. I find the designs to be refreshing and creative and more about new ways of envisioning woven wearables than the specific type of loom used to weave the cloth. Fifteen designs are presented in full detail, ranging from scarves and shawls to blankets, skirts, and fingerless mitts. There is also a wealth of technical information including hemstitching, fringes, seaming, picking up for knit or crochet, reading a draft and a step by step pictorial guide to direct warping a rigid heddle loom. And, speaking of hidden treasures, did you know we have our own series of weaving drafts designed specifically for the Valley Yarns line of yarns? This year we are showcasing designs created especially for our 40th anniversary in addition to dozens more that have been drafted by WEBS founder Barbara Elkins and other talented weavers over the years. Visitors to the store have the good fortune of not only being able to see them, but also to touch and investigate the drape and details of the pattern Online shoppers can find drafts on our website in a few ways. If you are looking for something to weave with a specific yarn, you will find a tab on that yarn page called “Related Patterns”. 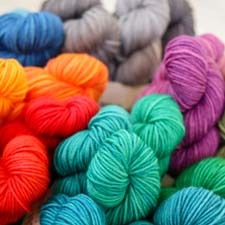 Click on it and you will be shown all the drafts/patterns we have created for that yarn. You can also find drafts on the drop down menu for Weaving and Spinning on the home page. You can narrow your search by number of shafts or just ogle the many possibilities while suffering from loom envy. Available drafts span the full spectrum of projects, from wearables, like scarves and shawls, to blankets, bags, table runners, placemats and the ever-popular dishtowels. And, yes, dish towels are the number one drafts we sell, with the hands down favorite being Carol Birtwistle’s 40th Anniversary Ribbon Towels. There’s something for everyone from rigid heddle weavers – Draft #55 Charlemont Lace Scarf – to 4-, 8- and 16-shaft designs. Have you discovered any hidden treasures in your wanderings? Let us know! This entry was posted on Wednesday, September 17th, 2014 at 8:00 am	and is filed under 40th Anniversary, Products at WEBS, Valley Yarns. You can follow any responses to this entry through the RSS 2.0 feed. You can skip to the end and leave a response. Pinging is currently not allowed.